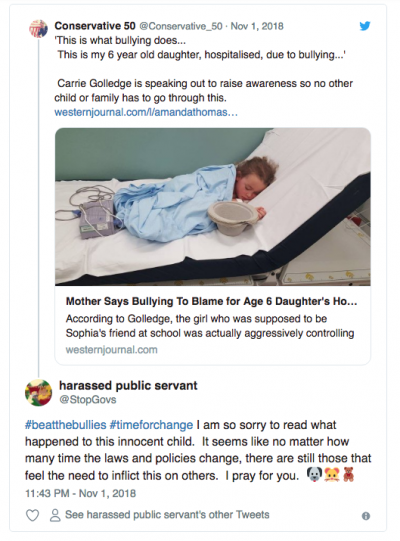 Carrie Golledge is just one of the millions of parents who had to go through something nobody with a child should have to endure. 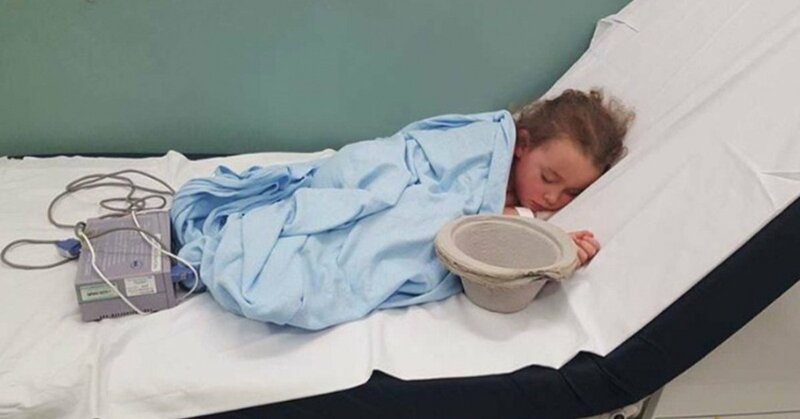 Carrie Golledge, the 29-year-old mother to Sophi, recently shared the harrowing story of how her 6-year-old-daughter was hospitalized due to the relentless bullying she received in school. And it is truly, truly awful. 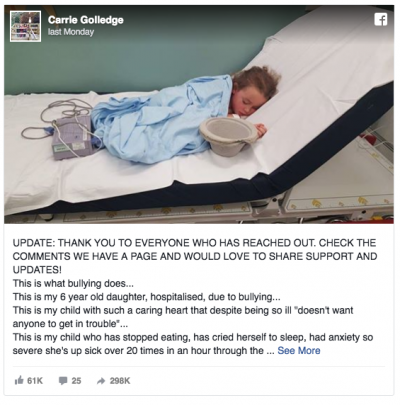 6-year-old Sophie was hospitalized for extreme anxiety, which was subsequently started by bullying, and her mother Carrie has had enough. In order to show people the true horrors of the effect bullying can have on someone, Carrie Golledge took to Facebook and posted a photo of her sleeping daughter inside a hospital. She also spoke of the truly awful treatment she had received from all of her young friends and even… yep, you’re reading this right… her teachers. Unsurprisingly, the post very quickly went viral. 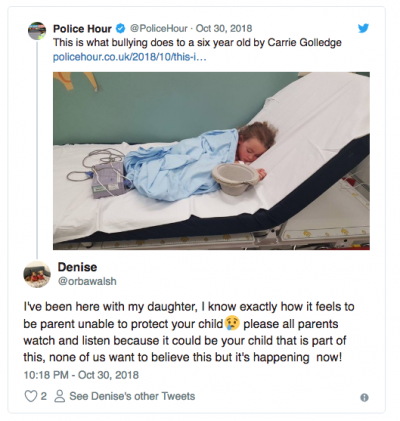 And even more so, the idea that a child could become so so anxious through something like bullying that they could actually become sick over 20 times an hour absolutely terrifed other parents. And so it should! Please help us share her story. Let’s show her the support her school couldn’t afford her. I truly hope that this mother and her daughter… along with all the other families who may be suffering from a similar time at the moment… get all the help they deserve. The thought that it’s now 2018 and bullying is still a regular occurrence, especially to such an extreme degree, is one of the most depressing and at the same time enraging thoughts I could possibly have right now.